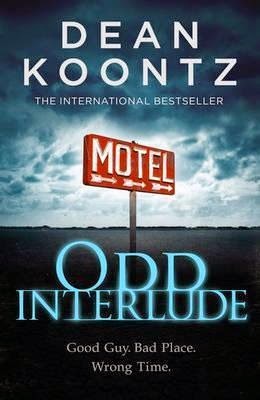 Odd Interlude by Dean Koontz is book #4.5 in the Odd Thomas series. It has been released in two ways, firstly in three volumes (#4.1, #4.2 and #4.3) and secondly collated in one volume or novella, which is what I read. Odd Interlude follows straight on from Odd Hours, but don't worry if you don't remember the plot line (or haven't read it), the gaps are cleverly filled in for the reader along the way. In this adventure, Odd travels a short distance to Harmony Corner where he senses evil and stops to help the citizens being held against their will. Annamaria is Odd's travel companion and plays a minor role in Odd Interlude. I was keen to find out more about her, but perhaps that will come in the next book. I was surprised there were no bodachs in the story (shadowy entities that flock to a person or area prior to death or disaster), but hopefully they'll reappear in Odd Apocalypse, the next in the series. I've been following Odd Thomas since the very beginning of the series which is concluding this year with Saint Odd, due to be published in December 2014. Of course, there's also the Odd Thomas movie, which was released in 2013. Has anyone seen it or read the books?